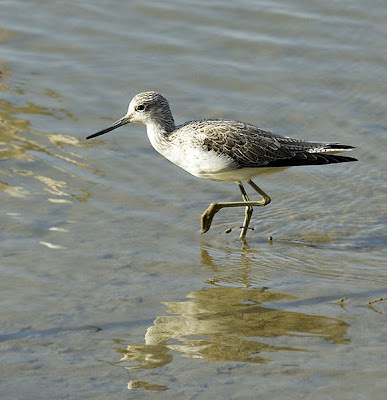 Greenshank Tringa nebularia, photographed by J. Dietrich. The genus Tringa includes the shanks and wood sandpipers, medium-sized long-legged shorebirds with relatively slight changes in plumage between breeding and non-breeding seasons. Characters (from Ridgway 1887, as Totanus*): Ears situated well posterior to eyes; exposed culmen more than one-fifth as long as wing; bill narrow at tip, where hard and smooth on top, tip of upper mandible thin with cutting edges far apart. Wing more than 110 mm long; axillars white or barred with white and dusky. Tail not more than half as long as wing, longer than exposed culmen. Back of tarsus with continuous row of transverse scutellae; hind toe present; middle toe united to one or both lateral toes by distinct web. *Due to different type species designations, many authors in the 19th and early 20th centuries applied the name Tringa to species now included in the genus Calidris. [WBSJ82] Wild Bird Society of Japan. 1982. A Field Guide to the Birds of Japan. Kodansha International Ltd.: Tokyo.